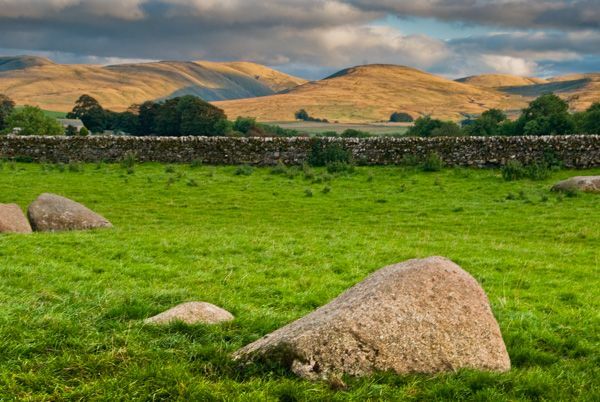 Gamelands is a recumbent stone circle lying at the foot of Knott Scar, one mile east of the village of Orton, in the west of Cumbria's Eden Valley. 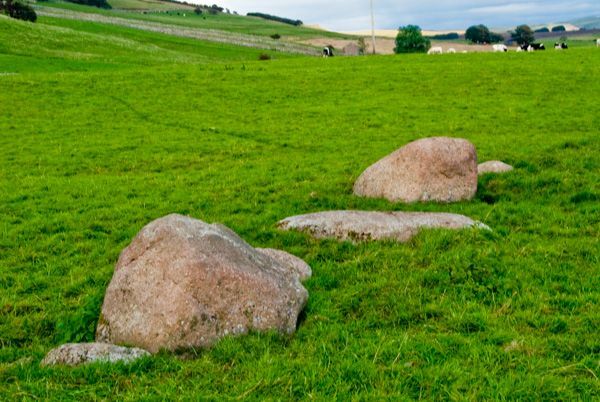 The stones form a flattened circle, or oval, about 45 x 38 metres in circumference (very roughly 145 x 125 feet). There were originally 40 stones, but of these only 33 remain. None are terribly large, with the tallest only 1 metre high. All are composed of local Shap granite, save for one, which is of limestone. 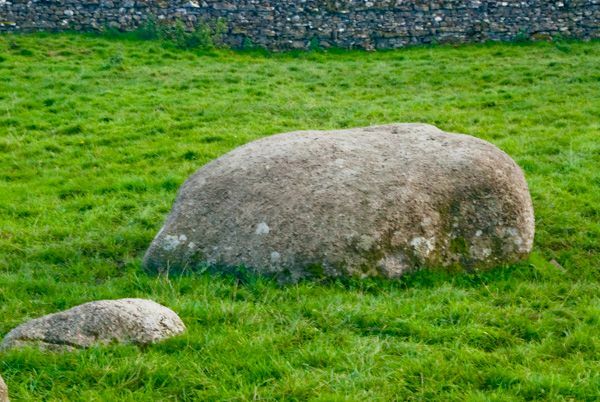 Some sources suggest that the stones have fallen, but a survey in 1966 concluded that it was impossible to tell whether the stones had ever, in fact, been upright. 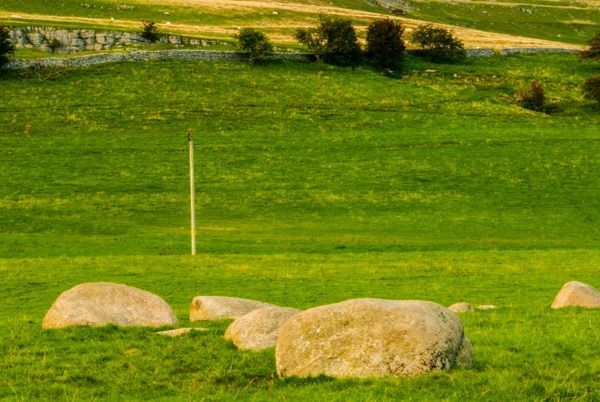 Some of the stones were damaged by ploughing in the 19th century and others were used to make the stone wall just south of the circle. 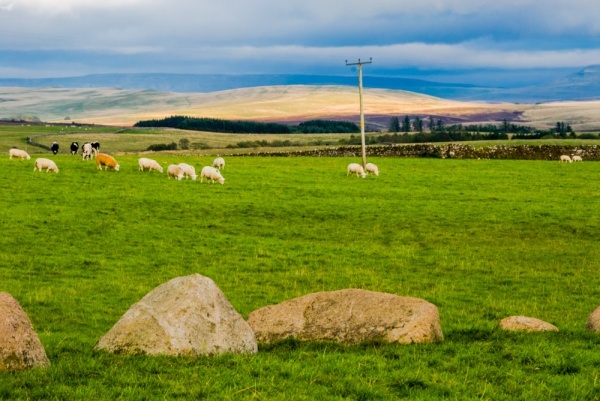 English Heritage calls Gamelands a 'Neolithic embanked stone circle'. I don't know where they found the banks, for they are not obviously visible. The circle is thought to have been built in the middle to late Neolithic period (roughly between 1800-1400 BC). Excavations in the centre of the circle during the Victorian period unearthed a possible burial cist and two pieces of flint that had been shaped into tools. The setting is wonderful, with views across the Eden Valley to the foothills of the North Pennines, and the limestone pavement of Knott Scar above the circle. Be aware that the circle is on private land. It is, however, very easy to view from Knott Lane. I parked at the end of Knot Lane and walked up the lane until I was opposite the stone circle.